My name is Lee Powell. 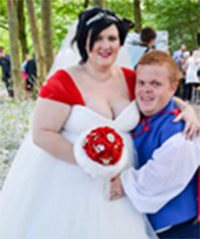 I am 29 years old and I live with a condition called achondroplasia, which is a type of dwarfism. You may be wondering why I have decided to share my story – well this is because I would like to raise more awareness about my condition and my daily living with the many challenges I face. Most people that I meet ask, “Lee, is your condition genetic related?” and the answer is No. All of my family are average height – my son who is now two is of average height and half the size I am already! My daughter who is due in July is currently measuring as average height, however we are unable to confirm this for certain until she is born. I was diagnosed with dwarfism at birth, and my parents were more than happy with this – back in 1989 the condition couldn’t be diagnosed from scans during my mum’s pregnancy. Whilst I was living at home, my parents looked for support groups to give them advice and tips, and eventually they found a charity called Restricted Growth Association (RGA) UK. It was when I was 12 years old that I noticed my legs was starting to bow, and I had to go to hospital to get this checked out. I spoke to a doctor who advised that I needed an operation on my legs to rectify this, otherwise I would end up in a wheelchair quite rapidly, and ultimately the decision was mine if I wanted to have the operation. I instantly said no, but two months down the line I thought “I can get time off school, so I will have it done”. I then arranged with the doctor to go ahead with the operation. The operation date came and I thought to myself “Have I made the right decision?”, and I thought “Yes, with the added bonus of having additional time off school!” I had my operation, and the next day the staff at the hospital advised me not to get out of bed until the Monday; however I stated to them that I wanted to go home, so I got up and did what I needed to do and was discharged on the Thursday. The following Monday morning my dad was like, “You ready for school?”, I was like “Er… I suppose!”, so I went off to school. The recovery process then started, and it was a very challenging time as I need to re-learn how to walk and mobilise, which I eventually did. After I had recovered fully from my operation, I got involved with the Dwarf Sports Association, an organisation for people with my condition and other types of dwarfism. I initially entered a couple of events for a laugh, and ended up winning a couple of gold medals! I was then asked in 2011 to go to Canada to represent the UK. I thought, “Wow, yes I will go”, and I won one silver medal in swimming and one gold medal in football. I have continued to partake in sports when I can. With my condition, every day can be a challenge with regards to the pain and the ability of what I can do. For example, some days I can walk and other days I am bed-bound due to the amount of pain I am in. In 2016 I started to suffer with pains in my back which were getting very strong – I ended up becoming paralysed, and my wife requested me to go to hospital to undergo spinal surgery. The spinal operation was carried out at Sheffield hospital and released a couple of trapped nerves in my back. After the operation I was advised by the hospital to stay in for at least a week, however the next day I was discharged as I had done everything that was required of me to meet the criteria to be released. I had to learn how to walk again and mobilise, which was a challenge – however I never gave up, and I managed to get back on my feet shortly after. Currently I am using a walking frame and a wheelchair, depending on the severity of my condition – however there are still times where I struggle to get out of bed. In 2015 I met my wife Danielle – we eventually got married on TV and had one child. With a second child on the way, to this day I haven’t regretted any part of my life. I must admit though that without Danielle I wouldn’t have been able to walk again. In 2017 I applied to join West Yorkshire Police as a call handler, and I thought to myself “I have no chance of getting into the police service with my condition”. Once I submitted my application, a couple of weeks later I got an email asking me to come for an assessment and interview. When I was in the interview and the assessment I was made to feel like “Lee” and not a disabled person. Everyone treated me like a person and not someone who has a disability – they asked me if I needed anything changing if I was successful. I advised them that I would need certain reasonable adjustments, and when I started these were put in place without any hesitation or questions. So I then started my journey with West Yorkshire Police. My wife asked me recently, “Lee how are you finding the police, are you fully enjoying it?” I replied, “Yes I love every minute of it, I am now part of the blue team and should have come to the police years ago.” I am always eager to go to work and I feel like I am part of an amazing team. I also get asked the question, “How do I deal with my daily life?” I just reply that you only live once, so make the most of it. If you have a dream, the only person stopping you achieving the dream is yourself – everything is possible.